Purely by coincidence, Ari’s comment appeared just a few days after I read 3-D Wizardry: Design in Paper Mache, Plaster and Foam, by George Wolfe. (The book is now out of print, but I managed to snag a reasonably-priced copy on amazon.com). In Wolfe’s book, he mentioned the process of making floats and large paper mache beasts, like dragons, using cardboard and contact cement. I searched everywhere online to learn more about this process, but I couldn’t find anything. Then Ari’s comment showed up, almost like magic. Unfortunately, the designs of the floats are guarded like state secrets, so Ari couldn’t send photos showing how the process is really done. And I can’t show you the photos from Wolfe’s book because they’re copyrighted. So we just have to use our imagination. If anyone knows any more about making big, hollow paper mache sculptures using this contact cement process, please let us know. I’m just now finishing up my second video about the wolf’s head sculpture, showing the sculpting of the eyes and nose. I’ll post it later today. The floats in Mobile parades tend to be larger than those used in New Orleans, and change radically each year according to the theme of the parade. This means a constant flow of large papier mache sculptures to attach to the float. I thought that the way we built them would be of interest to the folks here. We would coat each side of the cardboard and allow it to dry before tearing it into strips or sections. One nice thing about this adhesive is that it’s waterproof. (You can use the old-fashioned brown contact adhesive, but it requires solvent clean up, takes longer to dry and the fumes are toxic.) Don’t use the cardboard from waxed cartons as it won’t work. Thin single-ply corrugated is better than double-corrugated or double-layer as it’s easier to shape. Once the general shape is achieved we would smooth out the surface with torn sections of thin chipboard also coated on either side with contact adhesive. The best type of chipboard to use for this is the flimsy, cheap stuff. The nice thing about using the contact adhesive is that there is no drying time in the sculpture itself. Once you apply the dry cardboard and chipboard to the surfaces, they’re ready to go. Over this we would apply a layer of torn white butcher paper that we would adhere with either wallpaper paste or wheat paste. This is to give that surface a final smoothing and a surface for painting, and paint doesn’t stick to contact adhesive very well. For paint we used ordinary exterior-grade latex that we would custom tint with powdered pigments. I used to have a life-sized classic Grecian-style statue in my garden made this way, covered in my own blend of artificial stone. I made this from paper pulp mixed with cement and silica powder (also called flowers of silica). Silica powder is basically an extremely finely ground sand used mostly in iron smelting. This mixture makes a very nice ‘stone’ facing that I finished to look like marble. After sealing it with a standard concrete sealer (and regular applications thereof as needed) it stood for 5 years without any cracking or deterioration, internally or externally. Well that’s about all. If anyone has any questions, drop me a line. … Some of the societies Ari has worked for are the Infant Mystics, the Mystic Stripers, the Knights of Revelry, the Order of the Polka Dots, the Order of LaShe’s. You can find out more about the Mobile Mardi Gras here. Thank you, Ari, for giving us so much timely information about how Mardi Gras floats are made. And the comment about your garden sculpture is also really interesting – the “stone” coating sounds very similar to the rather expensive foam coat I’ve been thinking about trying lately. Your recipe sounds better, actually. Thank you for the information. It is most interesting. Back in the 1950’s and I believe in the 1960’s my uncle Ed ( Edward Norton) was responsible for the electrical and motorized motions of quit a few , if not most of the Mardi Gras floats. I had 5-6 complete detailed sets of plans but they have been lost over the years, sorry, had I known the historical value of these when I was a kid they would never have left my sight! Jonni- Thank you for your knowledge base which is your website. I am designing wings and a full body costume for my dear friend to use in parades. This will have legs and more. I’m using ideas which I’ve found in a variety of websites and videos now available. Since there are only a handful of people making head sets- I’m doing my best. I found a plan for a simple hat like base, created an inner support structure of chicken wire and layered paper strips using the mache paste. I am developing a form to shape the upper part of the head and also used a bowl to make large round eyes. The next challenge will be putting it all together and securing the antennaes. I used large sheets of cardboard with PVC pipe to give the wings a “cross-member” then secured that using paper towel tubing. I used wire and cutout sections to add lightness as well as depth to make the wings more realistic. Then I applied a thin layer of the paper mache clay over the thin layers of butcher paper and paper strips. Painting it next and will finish with a flat varnish for weather proofing help. I’ll take some pics at the end if it doesn’t look terrible. So far I am optimistic…. Hi Tim. This sounds like a wonderful project, an you’ve come up with some really creative solutions. We would love to see how it turns out. In fact, if you’d be interested in doing a guest post for us, with the how-to instructions you gave us, plus progress photos, that would be wonderful. Would you want to do something like that? If so, just let me know. I’m with krewe of St Patrick’s in pensacola. I’m looking for some help on making our float better. 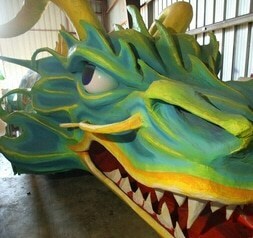 I would like to add an Irish dragon to the float. If you could contact me it would be greatly appreciated. Tara, this was a guest post, and I don’t’ think the author is watching this post any more. It’s difficult to find information about traditional methods of making paper mache floats. This is SUCH great info! Thank you so much for sharing all of your ideas. We are building a large bust of a woman for a float project. We think we have a pvc frame idea for the armiture–but I’m a little stuck on where to go from there? I’m thinking chicken wire to mold the frame and give it some structure, with the 3m/cardboard mache technique over that? Any tips, ideas are welcome since we’ve never done this! This is SUCH great info! Thanks so much for sharing. We are needing to build a float with a large woman’s bust. We have some ideas on the armiture, (pvc frame), but I’m a little lost on how to start the mache process with the 3m. We were thinking of sculpting with chicken wire for the form and then cardboard/3m mache process over that? Any feedback or tips are MUCH appreciated, we’ve never done this! Hi Alysia. I don’t know if Ari is still watching for comments on this post or not, and I’ve never made anything with the contact glue. I seemed to have the idea that they sculpt without wire underneath, but I have no idea how they would get the proper shapes without it. Your plan sounds quite reasonable. I hope you take photos as your project goes along. We have such a hard time getting information about how these floats are built, and if you figure it out, I hope you’ll share your experience with us. Hi guys … came across this post whilst looking for info on creating large strong paper mache structures. Im a complete newbie but over here in magical cornwall england we’re trying to get people interested in some of the old customs and celebrations that are been lost to modern times. One of these is montol which is a winter solstice celebration. We’re working on historical beasts that will come out during the feastival night and dance with a teaser. Im charged with making a large huma bird with resplendent wings. The head will need to be worn but needs to be a good 4ft higher than the shoulders and will need to look quite stoney and old. I love the ideas here …particulary the durability and strength of the sculptues … and im thinking of using some of these super cool techniques to make our Huma. Thanks for the post .. any ideas or pointers would be greatfully recieved. Would just like to say I worked on parades in both New Orleans and Mobile from 1993 to 1997… I believe the Dragon pictured on this website is or was part of the MOT Parade -Mobile…and was made by master prop and float maker Jules Stock who worked for Royal Artists out of New Orleans. Jules died last year and thought I should make sure he gets proper credit for his beautiful dragon….Rest in Peace Jules. Thanks, Jennie. Do you happen to have any clues as to how Jules made the dragon? Thanks, Jennie. I’ll head over to Google now. Thank you for sharing! The tip on diluted wood glue is great, any idea what that ratio of glue to water would be? Been doing more work with contact cement and cardboard, love working with this medium. This piece is mixed media but the head and hands are done using barth mache and covered in monster mud for strength. This is so timely! My daughter and I are working on a giant figure skate (hopefully 6 feet tall) to put on a float for a Santa Claus parade this year. Your site and so many of your followers and fellow artists have given me so many ideas that now I am starting to wonder what the best method might be to use? We have a very tight budget so I was intrigued by the idea of using cardboard and Styrofoam as the armature for the skate, but was not sure if this would support the large size? I watched the video of the making of your baby elephant (I LOVE elephants) and thought making a wooden armature was the right way to go (but it would be expensive and heavy I think), but now I am wondering about boxes and Styrofoam? What do you think? Would using these materials support a 6 foot figure skate? I love your site and all the wonderful sculptures you make! Hi Toby. Foam would probably work, if there was enough support for the connection points. You can get 4 x 8 sheets at the building supply store, and you might only need two. But foam is kind of expensive. Cardboard by itself should also be strong enough. You might need to make two or three rounds for the inside of the upright portion of the skate, using a cheap grade of plywood, and tack the upright cardboard pieces to the rounds. I’m having a hard time imagining how you would hold the rounds in place when the cardboard was being attached, unless you cut a big circle out of the middle, leaving just a round edge of plywood for bracing. Then someone could stand inside the circles, holding them up at least long enough for enough cardboard (or foam) to be attached. I think the person with that job could sneak out of the inside of the skate before the last few pieces of cardboard were added, to keep from getting trapped in there. I’m just thinking off the top of my head – I’m not sure that’s the best solution. You might also be able to find enough cardboard sheets to lay out on the floor and glue up two layers, staggering the pieces so the seams were well supported. When the glue was completely dry, you might be able to fold the cardboard, maybe even softening it a bit by walking on it, to get the realistic shapes you need. A tube for the upright, and a dome for the foot – cutting things judiciously and folding and gluing. When the cardboard is dry, begin adding your paper mache, beginning at the bottom, so the dried paper mache will support the damp paper mache above it. This is a fun problem – I think the folks make the Mardi Gras floats, like the author of this post, use the cardboard with the contact cement, and just make a really long piece of cardboard that they keep adding, in a spiral, until they’ve reached the top of their column (or dragon body, or whatever). I’m not sure the new safer contact cement would hold well enough to make it work, and I don’t know where you’d get the special cardboard they use. The float people seem to like keeping these secrets to themselves. I’m not sure if this would be very helpful. I know it’s something that can be done – no reason why it can’t – but you may need to get out a few sheets of paper and do some mental experiments to find the best way to go. When you get it done, please remember to post a photo so we can see how it came out. Thank you so much for your comments Jonni! I just got word from a local furniture/appliance shop that they will let us dig through their discarded materials to find all the foam and cardboard we want! I am not sure how exactly we are going to put it together yet (as you said, need to do some experimenting) but at least we have lots of materials to play with! I will definitely take some pictures of the project, but it likely will be a while before it is finished. The Parade is November 16th, so that is my deadline! Your site is very inspirational. Thank you so much for all your ideas and advice! The BIG skate turned out really well. See attached picture. It was about 6 feet high, 8 feel long and about 2.5 wide (so it would fit in our truck and through regular doors). I did keep a log of pictures when creating it. The big lesson I learned was – don’t use solid Styrofoam as filler (got it, with permission from appliance stores). Styrofoam expands in the heat and shrinks in the cold. When we moved the skate from the cottage basement in the summer to our garage at home (to finish it), it was a very hot day. The Styrofoam expanded in several places and busted through the paper mache. I fixed the tears (and a few more subsequent tears), but it was hard to manage with all the temperature changes. The second big lesson I learned is that glitter hides a LOT of imperfections. 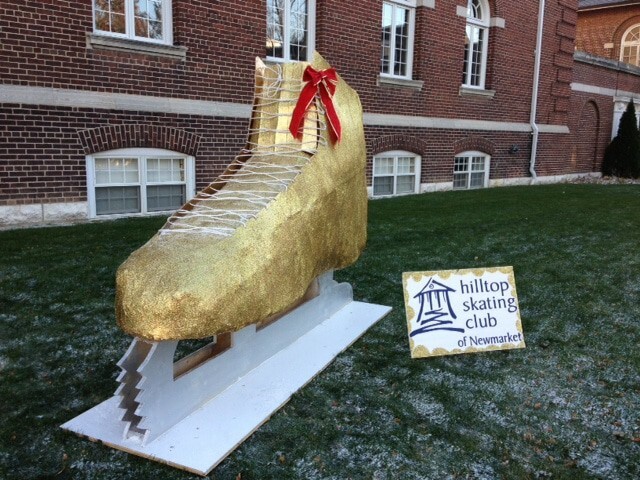 The gold glitter really helped turn the big skate into a really fun sculpture. Can the sculpture be left outside using this method? I am working on a large chicken sculpture that is going to be covered with fiberglass but I would love to try this instead. I cannot believe I found some info on this technique! 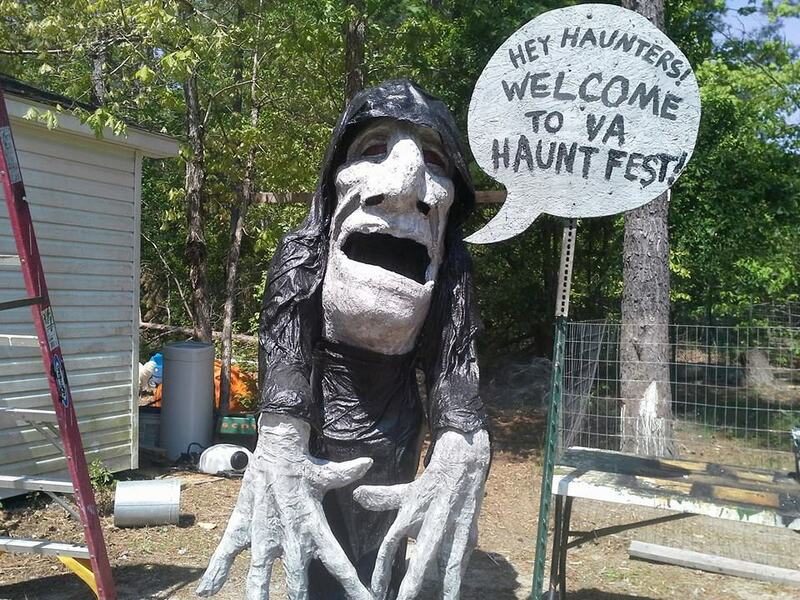 I love the giant heads and floats for Mardi Gras, I plan on using this for my haunted house. Thank you Aryea and Jonni. Dear Jonni, I am in a Mardi Gras krewe in Shreveport, LA. We want to learn how to make large float objects and would like to contact Ari Kahn about a workshop. Do you have his contact information? No, sorry – I don’t. Have you googled him? This is great, thanks to both of you for posting! Does anyone have information on how to get involved with making floats in Mobile? do you know who sells large paper mache objects…animals..buildings…golden gate bridge..im having a function for our local food bank and the theme is SAN FRANCISCO…food will be accordingly..sour french bread..crab.chowder soup.. looking for paper mache decorations..
Jonni, thank you for posting this on it’s own little page. I’m very flattered, and most appreciative. I wanted to mention that lumber and PVC piping aren’t the only items you can use for an armature. Before I used to work on the floats, I used to do creative makeup and set building for local community theatre. When you’re working on a low budget, you learn to get creative. One thing we used to do is raid the dumpsters of construction sites for broken sheets and cutoffs of hard pink or blue insulating foam. Sometimes the guys that worked the sites would put these aside for us if we asked them. (And maybe bribed them a bit with a nice box of Italian pastries. Down here Krispy Kreme may be king, but it’s amazing what a few cannoli and zeppole can do- with maybe a nice thermos of Italian-roast coffee to wash them down with.) We also used to search the dumpsters behind electronic and department stores for packing foam. (And I’m not speaking of the packing peanuts. Although those can be used as filler if contained in bin liners or other plastic bags.) And yes, we did on occasion raid the local recycling centre’s bins for foam as well. We just looked upon it as end user recycling. One thing we also used to do on occasion was to use commercial spray-foam insulation (not too often, this two-part stuff is expensive and never comes out of your clothes) over various-sized bin liners stuffed full of crumpled newsprint and taped together. This allowed us to create things like rocks and cave walls. After the foam had set up, we would carve it to shape and cover it with a good layer of papier mache. This works wonders when building “stone” walls, as I had to do seemingly ad infinitum during a production of Camelot. On a side note, a friend who saw the sets hired me to do smething similar for him. It seems that he belongs to the Historical Reenactment/Living History Society, and makes shoes and other leather goods for sale to other members and the public. Apparently part of the rules is that you have to have a period-correct tent or building to blend in at the event. He had designed a small shop to fit on a trailer (look up tiny houses on the ‘net and you’ll have and idea of what I’m speaking of) and he wanted me to make it look like it had been built during the late medieval period, with “full-timbered” framing and a “stone” foundation all made from carved foam covered with papier mache, then coloured to look like stone (the “wooden beams” were just painted red like they would’ve been originally) and water-proofed. I realize this might’ve gotten off-topic a bit, but papier mache is such a fun and interesting subject I do tend to drone on about it. There’s just so much you can do with it! Do you know in the past they even made carriages and furniture from it? The possibilities are endless. Right now I’m working on a grave marker for my uncle’s cat who passed away recently from cancer. I can’t really use papier mache in this case as the maker might be trod upon from time to time, so I’m going to have to make it out concrete and reinforce it with something that won’t rust or rot. The only thing I can think of is the material that they make emergency sandbags. I’m not sure what it is, but those things seem to last forever, so I’ll try it. I’ll try to take some photos if I can remember to do so, and if it is okay with Jonni of course, and isn’t too off-topic with regards to papier mache. I am very interested in learning more about using contact cement for mache. 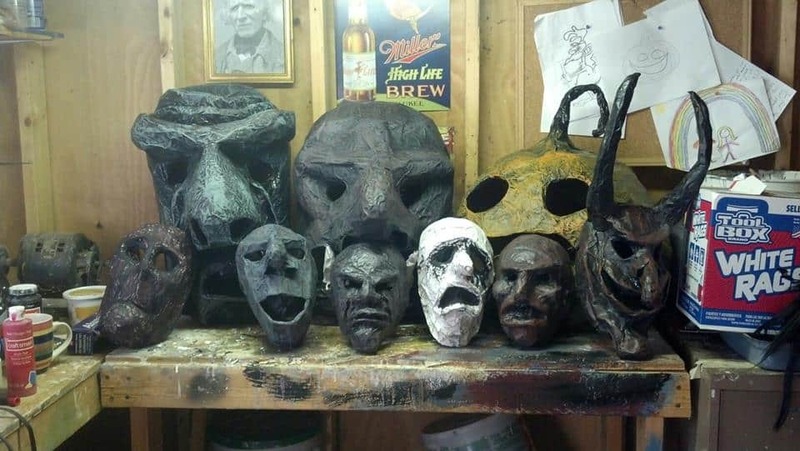 I have been experimenting making masks, this is a great medium. The book 3-D Wizardry is not detailed at all about making a large props using contact cement. I have been working a large head for a haunted house entrance but I have more questions than anything. I would really like to talk with you about this method. I have also looked for more detailed information about this process, but I have not been able to find anything. The float makers seem to like keeping some of their techniques secret, and some of the contact cement that was once used has now been labeled toxic. If you learn more, please let us know. Will do, its a great way to make armatures. Its very toxic, must be done outside or in well ventilated area and the contact cement is expensive. However, a lot of my work is outside during October, barth mache really can withstand the elements. 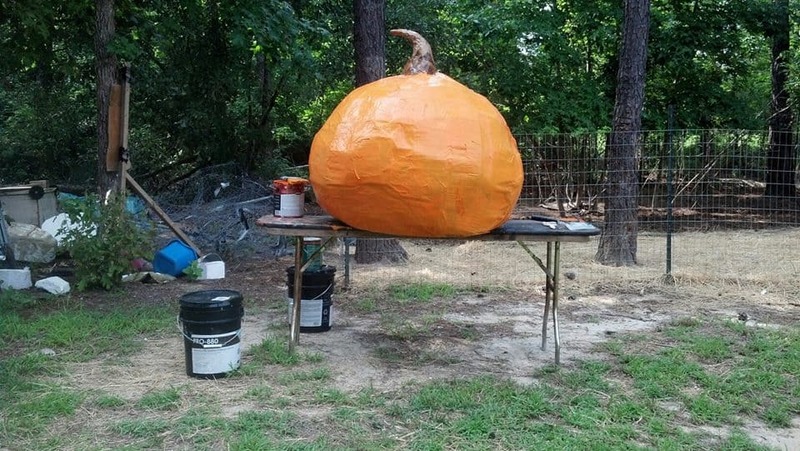 I have been working on big pumpkins of late. Hmmmm. This is interesting. I’m actually more interested in his use of silica powder and cement to make a stone texture. I did a little Googling on silica powder and found that diatomaceous earth (commonly called “D.E.”) — the stuff used in pool filters and available at any pool supply store — is essentially silica powder. It’s made up of 85% silica and trace amounts of alumina and iron ore (according to Wikipedia). Uses — aside from pool filters — range from mild abrasives to reinforcing filler in plastic. It’s also relatively inexpensive with a 25 lb. bag selling for around $20. I’m always interested in new techniques, and while I don’t know if I’ll be doing it anytime soon, I just may have to try out this method and see how it turns out. If and when I do, I’ll be sure to post pictures here. Yes, please do keep us posted on that stone idea. I’d like to find out more about it, too. What a nice surprise to see randomly drop in to this site (been popping in an out for over a year) and see an article on my native city. I adore Mobile Mardi Gras even though I’m miles from the Gulf Coast right now. It does sound lovely. I’m out here in Oregon, so I may never see the parade, but it sounds like such a treat.